Question: Can despair extinguish my spark of spiritual desire? Answer: Of course it can. I’ve already given way to despair in this world, and I’m no longer consumed with the earthly desires. Meanwhile, there is a “spark” that shines within me. It’s the awakening from Above that brings me to a teacher and a group. Between my despair and the spark emerges a tension, a vector, a force of desire that is caused by their difference. I don’t know where it is directed exactly, but it is already a subconscious direction towards bestowal. This Kli is already aimed upwards like a dipole (a pair of charges with opposite signs). To use my desire correctly, I place it in the “magnetic” field of the group. In this case, the group’s forces aim my dipole and move it in the direction of the goal, the quality of bestowal and love. The environment, the group, has powerful poles: a big disappointment with this world and the importance of bestowal. To the extent of my connection with this field, a common desire, it influences me and carries me along to the goal. Particles (dipoles, charges, particular desires) are powerless by themselves. To empower and accelerate them, we build accelerators. In the same way, the group (the common desire) blows up my spark of desire into a big fire. The principle is simple: I join the community and make my road to the goal quicker and easier by means of the common desire. When I join the group, I am taught how to become absorbed into this field, this common desire of bestowal and love. I receive more than just a desire from the environment because I’m not in a regular egoistic society, but I am surrounded by Kabbalists that want to reveal the Creator in their common field of desire of the Creator. I draw closer not only to the group, but to the Upper Giving Force that is concealed in our common desire. This is why in return for my efforts to unite, I receive from the environment the power of the Creator: the Light that Reforms. 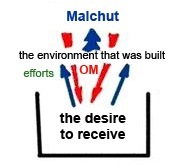 The environment that one builds responds to his efforts with the Surrounding Light (Ohr Makif, OM). What Does It Hide, This Spark Of Light?